The High Coast region and Umeå in Sweden as well as the Kvarken Archipelago in Finland have decided to work together to attract more tourists to the Kvarken region. EU has granted funding to the Spotlight High‐Low Coast project (World Heritage project focused on tourism and the economic life) via the Botnia-Atlantica programme. The project’s aims at increasing the business and marketing activities in the Kvarken region, and it focuses on the cross-border World Heritage Site High Coast / Kvarken Archipelago. 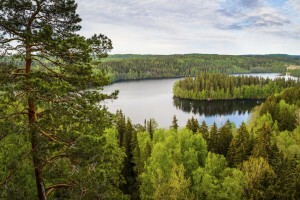 The Umeå Municipality also participates in the project because the Umeå region is a part of the natural route between the two parts of the World Heritage Site. The project’s target group consists of entrepreneurs, tourism organizations and World Heritage Site administrators in these three sub-regions that have decided to collaborate in order to create concrete product packages to tourists and even draw up marketing materials for the packages. All measures are to be directed at jointly agreed markets and they must be available for use in the cross-border cooperation in the Kvarken region. The concepts derived from this cooperation will be tested during the project and they will also function as models after this time. The cooperation with destination management companies in the concerned regions will be of utmost importance. – We know how to administer and manage the World Heritage Site, but we lack skills in its commercialization. In order to attract more tourists to the region, we need products that are usable on the international markets. At this time, such mutual product packages don’t exist, says Ms Marianne Sjöström, the Kvarken Council’s newly-appointed Project Leader for the Spotlight High‐Low Coast project. Sustainability is an important part of the project. Tourism is one of the world’s largest businesses. Therefore, it presents endless possibilities for experiences and economic growth, but it also wears away our lands. For this reason, the focus must be on sustainable tourism – taking into account, for instance, the destination’s environment when developing the tourism industry. The project is expected to contribute to the increased number of tourists in the region and, at the same time, complement Umeå’s and Vaasa’s efforts to improve the connections and trade over the Kvarken via the Midway Alignment project. – If we develop joint cross-border tourism packages, we can create our own unique experience. All destinations strive for more visitors, and nowadays tourists rarely incorporate just one theme or area into their holiday. We want our tourists to be able to make tours in our mutual region and, therefore, it is sensible to arrange the matter together. Thanks to the ferry connection, we can offer a unique chance to visit two countries offering extraordinary environments and experiences. In addition, the tourism industry has the largest growth potential even without big investments, Sjöström describes. The project organization consists of one full-time Project Leader from the Kvarken Council and part-time resources from the other cooperation partners: Visit Umeå Tourist Center, Höga Kusten Destinationsutveckling AB and Vaasa Region Development Company (VASEK). The total budget is 750 000 euros divided over a three-year period. The European Regional Development Fund covers 60% of the project funding via the Botnia-Atlantica programme. In addition to the Kvarken Council (the principal partner), eight other partners on both sides of the Kvarken participate in the project: Regional Council of Ostrobothnia, County Administrative Board of Västernorrland, Västernorrland County Council, Vaasa Region Development Company (VASEK), Vaasa Region Tourism/Visit Vaasa, Höga Kusten Destinationsutveckling AB, Umeå Municipality, Världsarvet i Kvarken r.f. (Kvarken Archipelago World Heritage site association).